Not only deep but also dark! FFor some years now my local dive club TSC Alpha has offered diving trips every month during the summer to give divers from Augsburg the chance to go diving somewhere apart from our local lake "Ilsesee", without the hassle of having to organize it themselves. To start the year with a real highlight my dive club normally has its first dive trip of the season at the Starnberger See. Located south of Munich (584 m above sea level), the Starnberger See is Bavaria's second largest lake (only beaten by the Chiemsee). Its maximum length from Starnberg (in the north) to Seeshaupt (in the south) is a whopping 21km. It reaches its greatest width of 4 km at Tutzinger Bay. The maximum depth is about 128m. very beautiful und impressive. To find the drop-off, it is easiest to snorkel to the surface marker buoy in front of the water rescue team cabin and then to descend along the shot line. The buoy is fastened to a concrete block on the ground at a depth of about 12m. If visibility is good, the edge of the drop-off will already be visible. If visibility is poor, just dive in a westerly direction. The edge is about 5m away from the buoy. Once you reach the edge you can see the wall drop down almost completely vertically. A last buddy and equipment check and then off you go(?) down into the dark. And the darkness should not be underestimated. At about 20m the surface is only visible as a diffuse light green; beneath you there is only darkness. 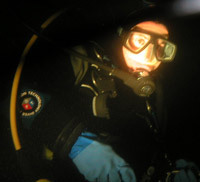 At the Allmannshausen drop-off a good dive lamp is not additional but basic equipment! It is therefore more than advisable to bring along a spare light, as being stranded at 30m in the Starnberger See without light is no fun. 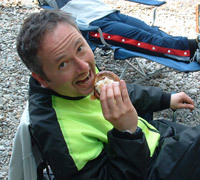 Where would a German diver be without his sausage? 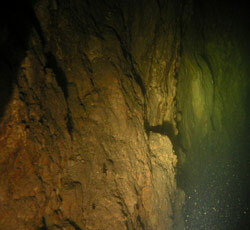 After reaching the deepest part of the dive (as agreed in the dive plan) it is time to slowly ascend. Diving leisurely upwards along the drop-off is the best time to keep an open eye for all the like life. The occasional char can be spotted, as well as burbots and trouts. Further up, there are/you might/will see freshwater mussels and crabs. Compared to some other lakes, this dive spot is not exactly teeming with life - but then that is not really its main attraction! As with every drop-off dive, excellent buoyancy control is absolutely elemental! For this reason, only experienced divers may come along - beginners are not normally allowed on this trip.